Part of the Tiddlywinks range for under 5s; Specific links with educational early learning goals; Easy to use in any pre-school setting; Designed specifically for groups with a high proportion of unchurched children and carers. God knows when i'm feeling...happy, cross, sad, shy and scared. 25 multi-purpose outlines and photocopiable take-home artwork pages. 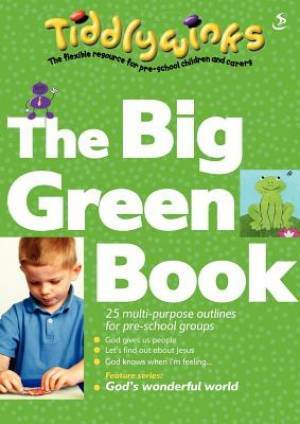 The Big Green Book by Various was published by Scripture Union in March 2003 and is our 12640th best seller. The ISBN for The Big Green Book is 9781859996959. Ideal book for the younger sunday school children, full of simple but effective ideas. We have used this series for nearly two years. Very versitile. Got a question? No problem! Just click here to ask us about The Big Green Book.